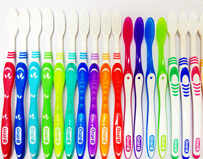 At Bride, we manufacture a wide variety of Tooth Brush Handles which are well-known for long lasting service. These products are made by using high quality raw material and latest technology. They are available in different sizes, shapes and colors in the market. Such products are most reliable and ensure safety and cleanliness of the brushes.